Warsaw, a city devastated by the Second World War, is brought back to life in a film which digitally reconstructs the city as it looked in 1935. 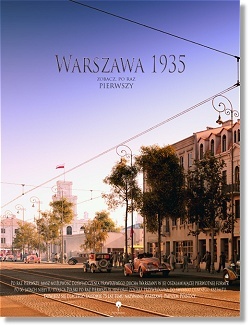 Elegant townhouses, beautiful cars, trams and horse driven carriages are seen once again in this view of 1930s Warsaw. The film lasts 20 minutes and was produced by the Newborn studio in Warsaw. The producers of the film were Ernest Rogalski and Tomasz Gomola. It took four years to create. On 15 March 2013 it was released in cinemas across Poland. The Polish Film Institute reports that there are also plans to screen Warsaw 1935 internationally. The main sponsor of the film is Prudential Polska Assurance Company. One of the buildings featured in the film is the tallest building in the city at that time - the Prudential building. "Warszawa 1935" - zwiastun from Culture.pl on Vimeo. Focus:: Warsaw 1935, Tomasz Gomola talks about how they produced the film on External Service Polish Radio (English Language), Warsaw.